februari 2012 | 506 blz. 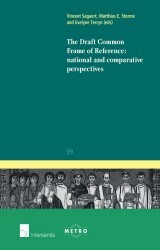 The Draft Common Frame of Reference is the result of more than 25 years of academic research on European private law, and was published in October 2009. Against this background, this book presents and critically analyses the DCFR, and situates it in relation to current Belgian and European private law.